Can I use Chapter 13 bankruptcy to get back my repossessed vehicle? The lender usually must not have sold off the vehicle to a third party purchaser. If the lender has not sold off the vehicle prior to the bankruptcy filing, the vehicle is still part of the bankruptcy estate. Your vehicle must usually be registered with the DMV and be insured. California State law requires that the property be insured and that the registration with the DMV be current. If proof of current insurance and registration is not provided to the lender, many lender’s will refuse to turn over the vehicle until proof of registration and insurance have been provided. You may be required to pay post petition fees incurred after the date of the filing of the bankruptcy case for storage or auction fees at the time of picking up your vehicle. In some circumstances, a lender may require that all storage or auction fees incurred after the Debtor’s bankruptcy case was filed be paid prior to the return of the vehicle. 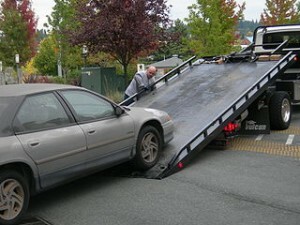 There are often separate storage fees for personal property that was in the vehicle at the time the car was repossessed. Usually, towing fees, and the fees associated with the storage of the vehicle between the date the vehicle was repossessed and the date the individual filed for bankruptcy can be included the Debtor’s Chapter 13 repayment plan. You may be required to secure a police department release. In many circumstances, once a car is repossessed a report is provided to the local police department so that there is a record on file if an individual reports their car lost or stolen. Many lender’s auto auction houses will require that you go the local police department and pay a small fee indicating that you will be redeeming the vehicle in bankruptcy. The local police department will than provide a receipt that be taken or shown to the lender and/or auction house as evidence of the release payment. A Motion for Turnover, is usually not, but may be required. In many circumstances, after the bankruptcy case is filed and notification of the bankruptcy has been provided to the vehicle lender and/or auction house where the vehicle is located, and the requirements above have been met, the lender will return the vehicle to the Debtor. However, some lenders refuse to immediately recognize that after a Chapter 13 bankruptcy is filed, all property, including a Debtor’s vehicle, must be returned to the Debtor. Accordingly, in some cases, a Motion for Turnover must be filed and there must be an Order entered by the Bankruptcy Court that requires the lender to return the vehicle to the Debtor. Chapter 13 allows you to cure missed payments on cars that are either leased or refinanced over a period of 3 to 5 years or longer through your Chapter 13 Plan. known as a cramdown of the vehicle loan. Requirements for cramdown in a Chapter 13 bankruptcy Case. Although the contract may call for a higher interest rate, Chapter 13 allows the interest rate of a vehicle loan to be modified to a market rate of interest such as 4% – 5.25 %. It does not matter when you purchased the vehicle in order to take advantage of this type of cramdown. However, in order to reduce the principal balance of the vehicle, the car must not have been purchased 910 days ago or less. This is known as the 910 rule. If the car was purchased 911 days ago or more, it may be possible to reduce the principal balance of the vehicle down to the fair market replacement value of the vehicle. A motion to value the vehicle in the bankruptcy case may be required to be filed with the Bankruptcy Court in order for the Court to issue an order to determine the replacement value of the vehicle. How do I know if Chapter 13 Bankruptcy is the right option for me to get back my repossessed vehicle? Although Chapter 13 Bankruptcy is a very powerful tool, it is not always the best choice for everyone looking to get back their repossessed vehicle. Speak with a Los Angeles bankruptcy attorney today to determine if filing for Chapter 13 Bankruptcy is the right option for you.